The Girl From Everywhere was one of my favourite books of 2016, so as soon as I saw this beauty available to review, I nabbed it. I waited a little while to read it because I have been in the worst reading slump of all time, and I wanted to make sure I was a) in the mood to read fantasy, and b) prepared to give it my utmost attention. I’m kind of glad I waited so long, because the way this one ended leaves so much room for a sequel that I’m pretty sure is coming. Or, at least, some sort of follow up story. Because that ending was not okay. Anyway, back to the actual point of this review. 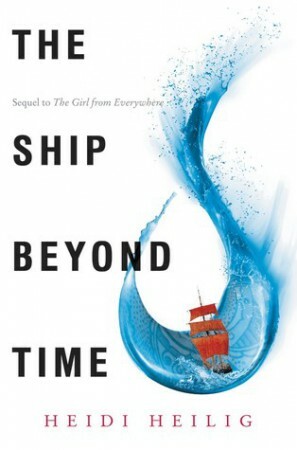 In short, I loved The Ship Beyond Time! It had the same alluring fantastical feel that The Girl From Everywhere had. So much so that I ended up reading the entire book in less than a day. Seriously. After months of forcing myself to read everything, it felt amazing to fly through this. I just couldn’t put it down. There’s a tonne of time travel in this one that had my brain doing somersaults. It at was all timey-wimey, and a couple of times I had to put the book down and repeat what I had just been told because the timelines were all over the place. Just like an episode of Doctor Who. It was fantastic. I just love time travel stories so much. The plot format felt incredibly similar to the first book in terms of structure and pacing. That’s not necessarily a bad thing, and it shows that Heilig put a lot of thought into the structure of the book, but I just wanted to point out this similarity in case you were wondering if there were any slumps or crazy side-plots. There weren’t, and everything fit together pretty nicely. Also, I need to say that MY SHIP IS LEGIT. I knew it! An interesting addition to the story was Kashmir’s chapters. I really enjoyed them, although I don’t feel like they’re were overly necessary. I’d have been more than happy with just having Nix’s point of view. However, I don’t think including Kash’s point of view detracted from the plot or the pacing. It was actually quite interesting to get inside his head. But I don’t think the book would have been lacking anything if his chapters hadn’t been there. Like I mentioned above, the ending was left very open. Apparently this series is just a duology, but I’m questionning that because of that ending. It can’t be, right? Overall, I’m really pleased with how this series has turned (is turning?) out. Heilig’s writing is incredibly gripping, making this the perfect read-in-one-sitting book. I adore the time travel, and the characters (I want to know more about the side characters though, please and thank you), and all of the Navigation stuff. Go and pick this up if you haven’t already! Eeep, I can’t wait to read this one! The Girl From Everywhere was also one of my favorites last year, so I’m thrilled to see so many great reviews for the sequel 🙂 Fabulous review!